Posted in Education: The Heart of FPMT. 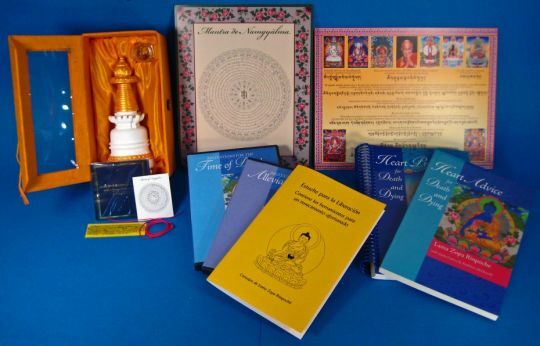 Of the thousands of items offered by the FPMT Foundation Store, the Liberation Box: Tools for a Fortunate Rebirth is one of the most unique and special. It is a collection of materials to assist students at the time of death. Assembled according to Lama Zopa Rinpoche’s specific advice on what a person should hear, see, and have placed on their body, the Liberation Box contains powerful methods for ensuring a fortunate rebirth for those who have died or are in the process of dying. The box includes a Kadampa stupa filled with the four dharmakaya relic mantras, a powa pill, a cord blessed by Lama Zopa Rinpoche, plus various mantras and a copy of Shetor to place on the dying person’s body. The Liberation Card for a Dying Person, a Namgyälma mantra card, and the CDs Recitations to Alleviate Pain and Recitations for the Time of Death are also included to be seen and heard by the dying person. In addition, the books Heart Practices for Death and Dying and Heart Advice for Death and Dying, and a booklet with instruction on how to use all the items and additional mantras are all part of the Liberation Box. “So much went into creating the Liberation Box. So many people have put work into it. And it was requested by Rinpoche. The Sangha at Rinpoche’s house in Aptos, California, are involved, creating and consecrating the stupas. Volunteers bring them up to Oregon and they are painted in the Foundation Store. 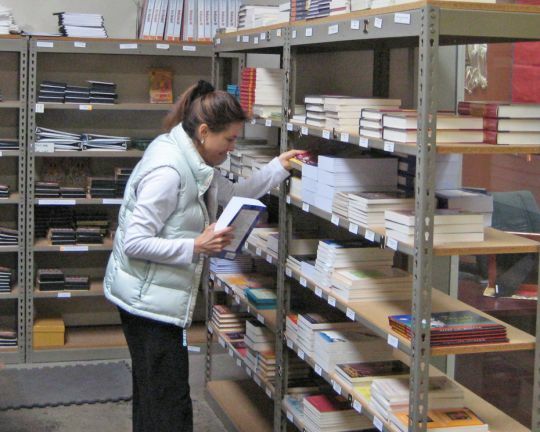 Every little thing has a story,” Foundation Store manager Diana Ospina said. The powa pill included in the box was made by either Geshe Lama Konchog or Khensur Rinpoche Lama Lhundrup at Kopan Monastery and was blessed by His Holiness the Dalai Lama in his home in Dharamsala, India, and also blessed in the FPMT International Office by His Holiness the Dalai Lama and His Holiness Sakya Trichen. The stupa and smaller items come packed in a specially designed golden paper box from Nepal. The FPMT Foundation Store, which assembles the Liberation Box, has been making the boxes available since May 2010. To date, 745 Liberation Boxes have been distributed around the world. 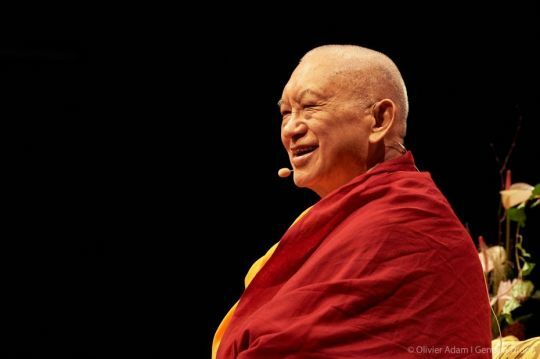 Posted in Advice from Lama Zopa Rinpoche, Education: The Heart of FPMT. Lama Zopa Rinpoche, Saviese, Switzerland, November 2018. Photo by Olivier Adam. Lama Zopa Rinpoche gave advice regarding merit multiplying days such as the Fifteen Days of Miracles, Saka Dawa, Chokhor Duchen, and Lhabab Duchen. The next merit multiplying day is Saka Dawa on June 17, 2019. On the day of Guru Shakyamuni Buddha’s turning the Wheel of Dharma, if you do one prostration while reciting the names of the Thirty-Five Buddhas, it becomes equal to having done 100 million prostrations while reciting the names of the Thirty-Five Buddhas. If you recite one Vajrasattva mantra, it becomes the same as having done the Vajrasattva mantra 100 million times. If you recite the Diamond Cutter Sutra (Vajra Cutter Sutra) one time, it becomes the same as having recited the Diamond Cutter Sutra 100 million times—so that much purification and you collect that many merits to quickly be free from samsara, and if the practices are done with bodhichitta, then to quickly achieve enlightenment. Reading the Golden Light Sutra (Sutra of Golden Light), besides the personal benefits that creates, also brings so much peace in the world, for the Buddhadharma to last a long time, which means more sentient beings being able to meet the Dharma and to achieve enlightenment. Then, also reciting the Arya Sanghata Sutra, which brings success, including enlightenment. Each recitation becomes 100 million recitations—so please tell your parents and friends this. This is the best way to help your parents and this really helps your parents. You can tell others this also and their friends. This really helps the world, to make a better world. Please read my notes well. Don’t rush. Think about each word. Also on these days, you can do tonglen—taking others sufferings and giving away one’s own happiness—then, also rejoicing. You can meditate on dependent arising (meaning, emptiness only) and develop bodhichitta. Of course, you can do self-initiation during this very special time according to the time in India. If you want to know which lama and which text mentioned this, it was His Holiness the Dalai Lama’s and His Eminence Sakya Trizin’s guru—Chobgye Trichen Rinpoche. Rinpoche referred to Guru Shakyamuni Buddha’s teaching Dulwa Lung (‘dul ba lung) as saying that the number the merit multiplies by is 100 million. It is a great advantage to practice during these times; like for myself, who is the most extremely laziest person in this world. Another very important practice to do on these days is taking the eight Mahayana precepts for one day until the next day at sunrise. That doesn’t mean necessarily until sunrise Indian time. It means sunrise at the place where you are; up until dawn, when the sun rises in your part of the world. In case there are difficulties to keeping all eight precepts, perhaps due to work, for example, you can take the rest of the vows well. Taking the eight Mahayana precepts is so beneficial for world peace, for crops to grow well, to receive timely rains—all this is needed to make the world better. Then, there are incredible benefits for yourself. This is explained in the book of the eight Mahayana precepts. This is so important for your own life to be better and to make the world better, to bring benefit. 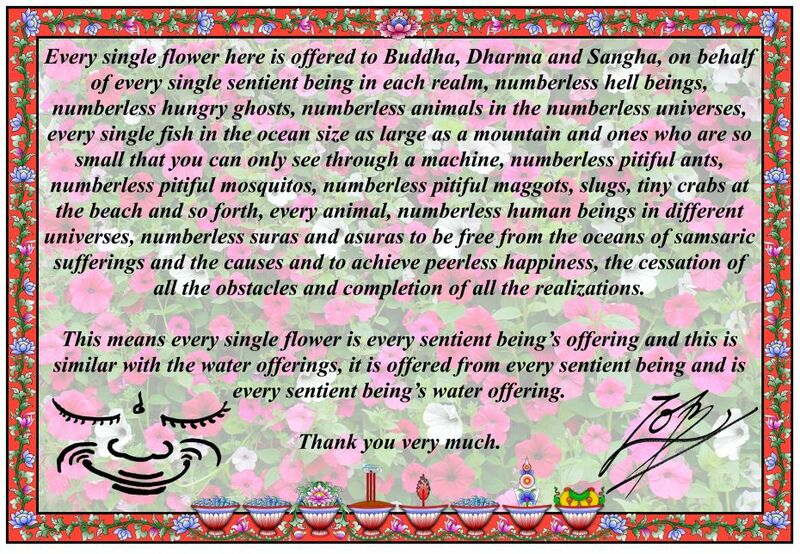 Written by Lama Zopa Rinpoche, August 2017, United States. Edited by Michael D. Jolliffe for publication on FPMT.org. 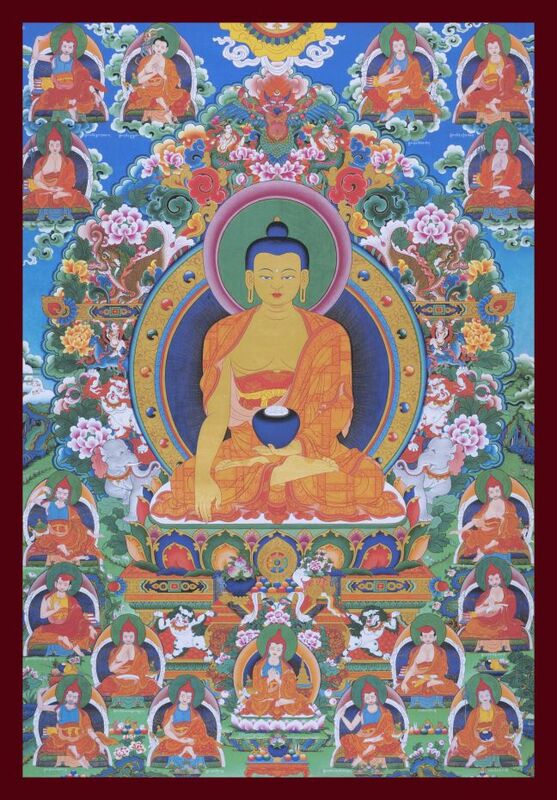 The Namgyalma mantra is extremely powerful and is the main mantra to purify and liberate beings from the lower realms, purify negative karma, and help those who are dying or have died either by chanting it in their ear or placing it on their body. Lama Zopa Rinpoche has discussed many times its power and use to benefit sentient beings. 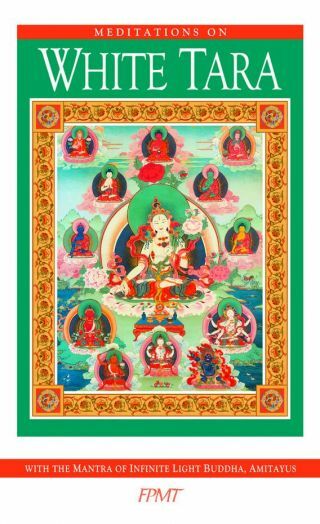 The FPMT Foundation Store currently makes available several items featuring the Namgyalma mantra, including amulets, cards, and stickers. 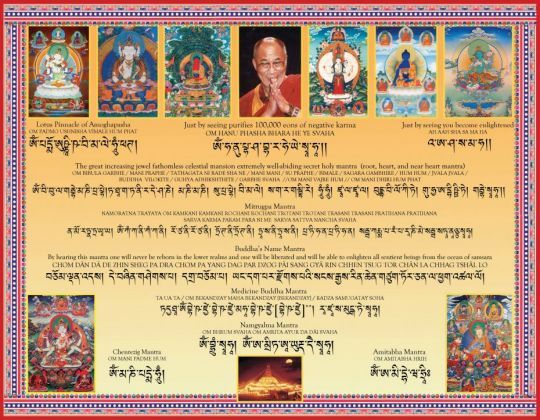 The Namgyalma and Lama Atisha Protection Amulet is a printed mantra packet that contains the Namgyalma Mantra Wheel and the Lama Atisha Protection Mantra. In addition to the benefits taught by Lama Zopa Rinpoche for each mantra, keeping this amulet close to one’s body protects one from harm and mental pollution. This amulet also contains these powerful mantras: the Phagpa Chulung Rolpai Do Mantra, which upon seeing, purifies 100,000 eons of negative karma and obscurations; the Wish-Granting Wheel Mantra, which purifies one thousand eons of negative karma for anyone that passes beneath it; and the Six Syllables of Clairvoyance Mantra, which after fifteen days upon seeing, purifies any heavy negative karma created in the past. The Namgyalma Mantra Card (seen above) is a colorful modern take on the Namgyalma mantra and comes in two sizes. The Namgyalma Mantra Car Sticker is meant to be put on your car so that when insects inevitably die as you drive, the Namgyalma mantra helps to purify their negative karma and support their good rebirth. The Foundation Store also offers Mantra Stickers—Protection From Negative Energies. There are three stickers available: the mani mantra, the Shakyamuni Buddha mantra, and also Kalachakra yantra. Since all of these mantras are to be seen as holy objects, students are reminded to take care when placing the stickers, cards, and amulets, and demonstrate proper respect for them. Through comprehensive study programs, practice materials, and training seminars, FPMT Education nourishes the development of compassion, wisdom, kindness, and true happiness in individuals of all ages. Students can now find two images—Wheel of Life and Guru Shakyamuni Buddha with the Seventeen Pandits—in PDF format. 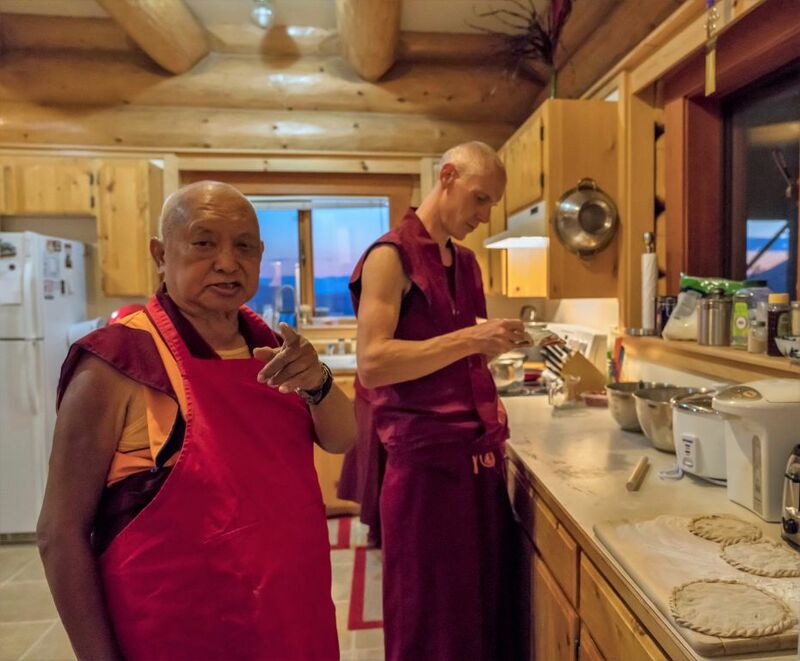 Lama Zopa Rinpoche recommended in early 2019 that it would be good for FPMT centers, projects, and services to have access to a particular image of the Wheel of Life. Lama Zopa Rinpoche asked that a translated verse be included with the image. Energetically undertake THIS and renounce THAT. The one who engages in this Dharma that subdues the mind VINAYA. Like an elephant in a mud hut, destroys the domain of the Lord of Death. The one who is extremely conscientious and careful engages in this Dharma that subdues, thoroughly abandoning the wheel of birth and bringing suffering to an end. This image of the Wheel of Life was painted at Tushita Meditation Centre, India, at Rinpoche’s request. The creation of the painting was overseen by Jhado Rinpoche. 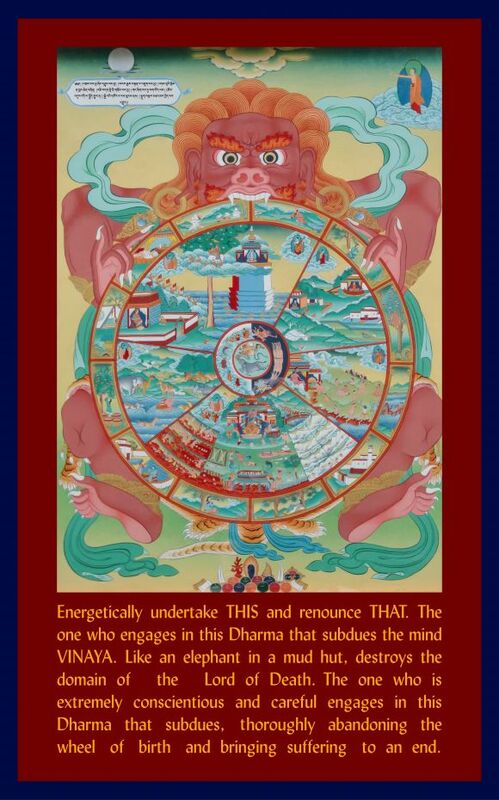 Lama Zopa Rinpoche considers this particular image of the Wheel of Life to be correct. Lama Zopa Rinpoche also recommended that it would be good for FPMT centers, projects, and services to have access to an image of Guru Shakyamuni Buddha with the Seventeen Pandits. 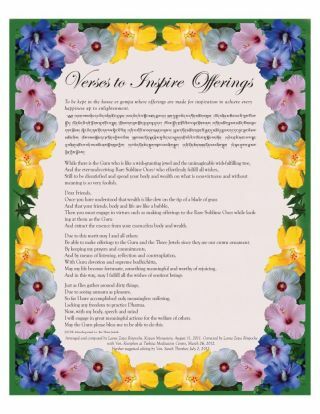 Lama Zopa Rinpoche created the Flower Offering Card as a welcoming and explanatory sign for anyone visiting the gardens of his house in Aptos, California, United States. Rinpoche said that any student is welcome to use the same sign in front of their own offerings. Every single flower here is offered to Buddha, Dharma and Sangha, on behalf of every single sentient being in each realm, numberless hell beings, numberless hungry ghosts, numberless animals in the numberless universes, every single fish in the ocean size as large as a mountain and ones who are so small that you can only see through a machine, numberless pitiful ants, numberless pitiful mosquitos, numberless pitiful maggots, slugs, tiny crabs at the beach and so forth, every animal, numberless human beings in different universes, numberless suras and asuras to be free from the oceans of samsaric sufferings and the causes and to achieve peerless happiness, the cessation of all the obstacles and completion of all the realizations. 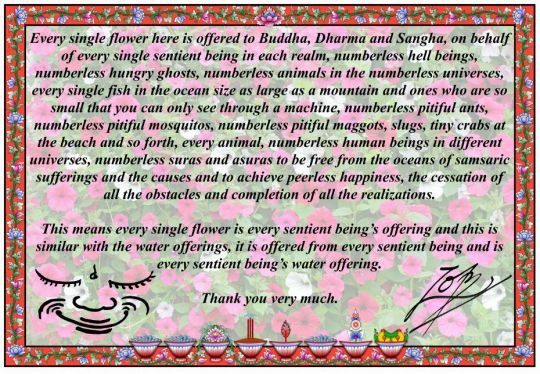 This means every single flower is every sentient being’s offering and this is similar with the water offerings, it is offered from every sentient being and is every sentient being’s water offering. Students can now find two texts—Meditations on White Tara and A Meditation on Orange Manjushri—in ebook and PDF formats. 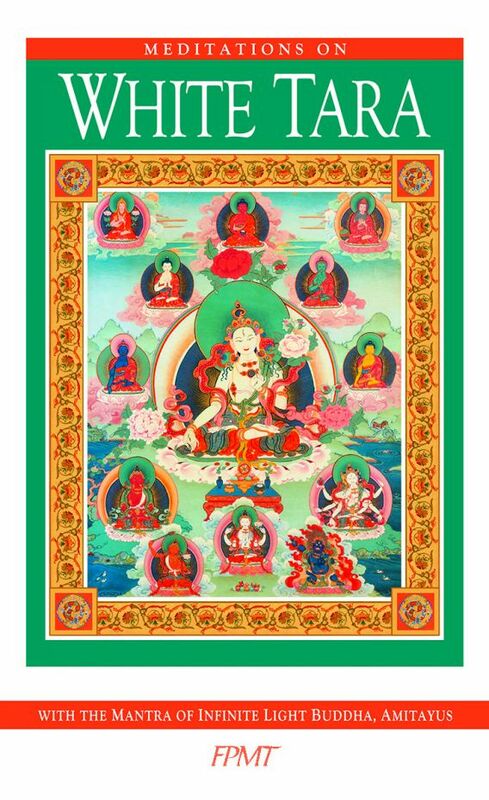 Meditations on White Tara contains practices to strengthen and restore health and life-force energy. By relying on White Tara, students are able to accumulate merit and purify negative karma in order accomplish their aims. If one has experienced many health problems, accidents, depression, or a loss of vitality, the practices of White Tara might be helpful. These White Tara meditations can also be done on behalf of oneself or others, and are frequently done to remove obstacles to the long lives and health of one’s gurus. A Meditation on Orange Manjushri includes “A Meditation on Orange Manjushri,” a short sadhana written by the Fifth Dalai Lama as well as “Practice to Receive the Seven Types of Wisdom.” These practices are considered excellent for developing wisdom and clarity, improving one’s memory, and for understanding and explaining Dharma to others. 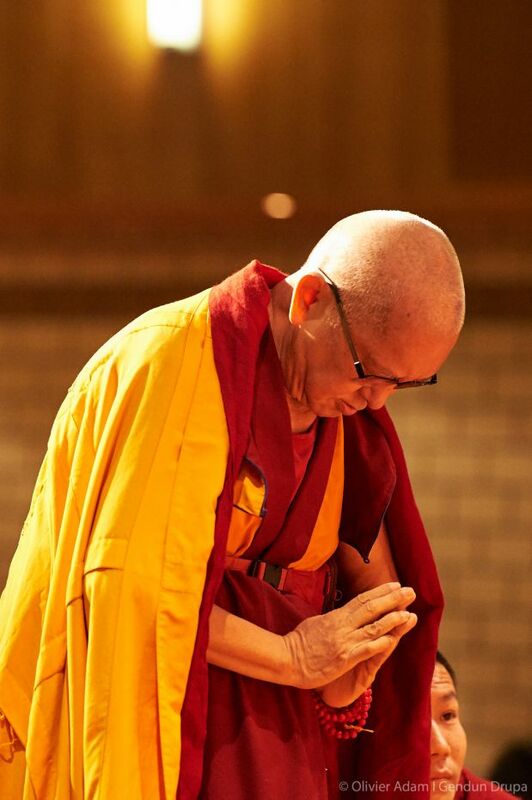 Lama Zopa Rinpoche, Martigny, Switzerland, 2018. Photo by Olivier Adam. Find lamrim resources—including teachings, commentaries, prayers, audio programs, comprehensive study programs, and year-long meditation schedules—on FPMT.org to assist your study and practice. To follow this advice, consider using FPMT Education Service’s lamrim schedule template—available as an Excel spreadsheet and PDF—to help you plan daily lamrim meditation over the course of a calendar year. 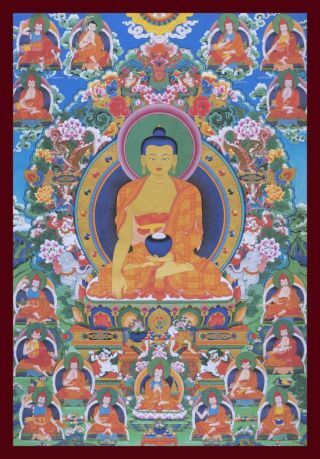 The template was created on the basis of the book The Essential Nectar, a commentary by Geshe Rabten on The Essential Nectar of Holy Doctrine, an 18th-century lamrim text by Yeshe Tsöndru. Flower offering, Buddha Amitabha Pure Land, Washington, US, August 2018. Photo by Ven. Roger Kunsang. Students can now find Recognizing the False I in PDF and ebook formats in the Foundation Store. 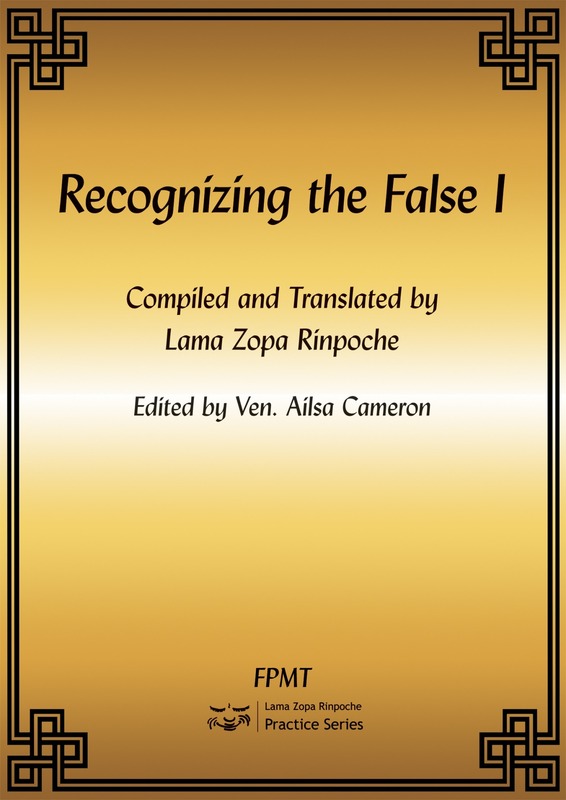 Recognizing the False I, written by Lama Zopa Rinpoche, is a commentary on and set of simple meditation techniques for identifying the object to be refuted—what Rinpoche calls “the false I”—during reflections on emptiness. The text was specifically composed for students engaging in the self-generation portion—often called “the ultimate deity”—of kriya yoga tantric practices, such as nyung nas. The meditations can also be used by students during retreats on the Heart Sutra or any other retreat focused on emptiness. Additionally, Rinpoche offers these techniques to all students in general to help them meditate on emptiness correctly during their daily practices. In the complimentary Living in the Path module “Bodhichitta Mindfulness,” Lama Zopa Rinpoche shows students how to take the essence of our precious human life by transforming our normal daily activities—walking, washing, dressing, etc.—into a cause of enlightenment by doing them with a bodhichitta motivation to benefit all sentient beings. Lama Zopa Rinpoche cooking with Ven. Tharchin, Buddha Amitabha Pure Land, Washington, US, June 2018. Photo by Ven. Lobsang Sherab. Lama Zopa Rinpoche designed the Purifying the Cause of Samsara door card as an easy way for students to regularly purify negative karma. To use the card, place it above your door in order to benefit from the two main mantras it features. The mantra “OM HANU PAHASHA BHARA HE YE SVAHA,” when seen, purifies 100,000 eons of negative karma and obscurations. The Wish-Granting Wheel mantra, “OM PADMO USHNISHA VIMALE HUM PHAT,” when passed under, purifies 1,000 eons of negative karma and obscurations. Rinpoche teaches that beings only receive the benefit of these door blessing mantras if they walk directly underneath them. With this in mind, Rinpoche recommends that students acquire a sufficient number of mantra cards to take up the width of the door frame. 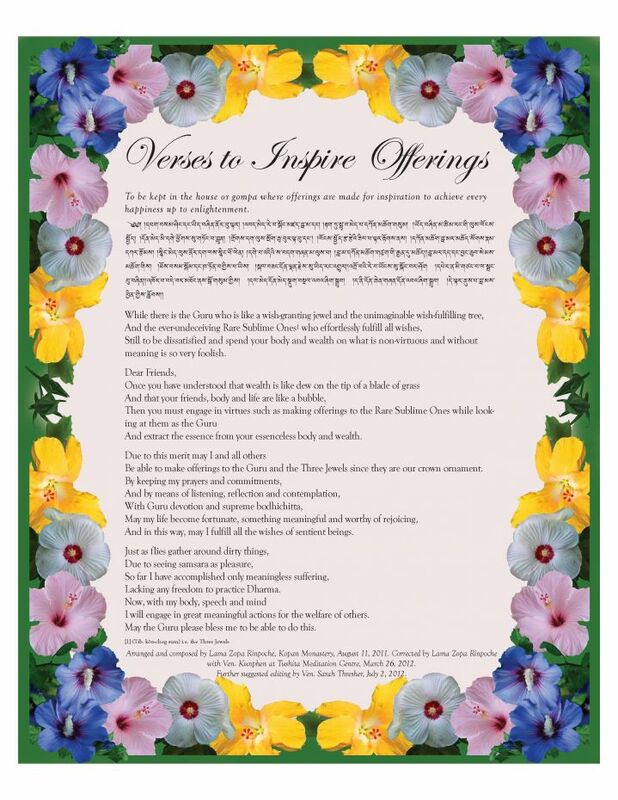 Composed and arranged by Lama Zopa Rinpoche at Kopan Monastery, Verses to Inspire Offerings is a frameable one-page offering prayer card that Lama Zopa Rinpoche suggests can be displayed in one’s gompa or home. Still to be dissatisfied and spend your body and wealth on what is non-virtuous and without meaning is so very foolish. And extract the essence from your essenceless body and wealth. Be able to make offerings to the Guru and the Three Jewels since they are our crown ornament. And in this way, may I fulfill all the wishes of sentient beings. Lacking any freedom to practice Dharma. I will engage in great meaningful actions for the welfare of others. May the Guru please bless me to be able to do this. 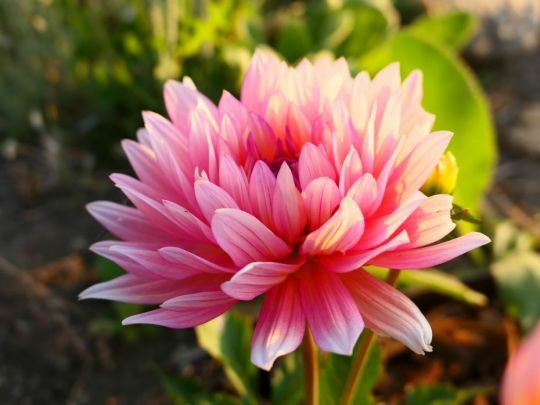 The Liberation Card for a Dying Person includes images and mantras that by merely seeing them help a dying person to purify negative karma and be led to enlightenment. The front of the card features ten mantras and ten images especially chosen to benefit someone at the time of death. Please look at these mantras quite often; especially, look at these mantras when you are leaving from this old body. Dear one, please don’t cling to anything and let yourself become completely free. In this most important moment of life, you don’t need to be afraid at all of being born in the lower realms and so forth. I give all my merits of the past, present, and future to you, to have a happy journey and a happy, wonderful, sunshining future. I give my big love to you. All the buddhas and bodhisattvas love you, and you are in their care. May anyone who sees these mantras be immediately reborn in the pure land where one can become enlightened or receive a perfect human body by quickly actualizing the causal vehicle, the three principles of the path, and the result vehicle, the secret mantra Vajrayana, based on correctly devoting and only pleasing one’s own holy guru. To think this thought again and again is extremely good. Practice with the bodhisattva attitude every day. People can’t see your mind; what people see is a manifestation of your attitude in your actions of body and speech. So pay attention to your attitude all the time. Guard it as if you are the police, or like a parent cares for a child, like a bodyguard, or as if you are the guru and your mind is your disciple.